Without doubt, the most important achievement by humanity would be the ending of war. This achieved, men’s energies would be released to tackle the many other pressing problems which beset them today: the millions who starve needlessly in a world of plenty; the precarious ecological imbalance of the planet; the ever-widening gap between the developed rich and the developing poor nations; the growing incidence and fear of terrorism, ever more sophisticated; the hardship and fear engendered by the economic collapse around the world. Some governments try to cope with some of these difficult problems while still others are main culprits and instigators of them. What can humanity do? How to start when each problem grows out of another, and all seem intractable? From Our viewpoint, these problems are real and pressing, and stem from one single condition: the separatism which sits like a heavy yoke on the shoulders of humanity and prevents all action in unison. Ideology rather than reason still guides the minds and actions of governments whose decisions affect the lives of all. They seek friends and allies to support their position, and thus are built the power blocks which strive for supremacy in the minds and hearts of men. Today, this problem is increased by the re-opening of the religious divide between Christianity and Islam. In a growingly secular world, the fundamentalist adherents of both religions are more and more bellicose, raising the temperature of confrontation to ever more dangerous heights. In particular, Islamic terrorism, in complete contradiction to the teaching of the Prophet, has brought a new dimension to the struggle for a peaceful world. How can this process be reversed? There is but one way to grapple with these problems, one which has never been tried but which, at a stroke, would ease the lot of countless millions and bring, at long, long last, true and lasting peace to a world in agony. Men must realize that they are not separate, never were and never shall be, that they are part of a divine and seamless whole which enfolds us all, to which, in our own way, we give the name of God. Men must realize that God is peace, is justice, sharing and trust, and that their fear is also the fear of their brothers. Maitreya’s task is to show men this truth, and to remind them that at the core of their yearning lies the peace they all desire, waiting to be made manifest. Q. Did they all take place in the USA? Q. Has Maitreya now been interviewed by other networks and TV hosts? Q. Have any interviews taken place outside of the USA now? Q. Were there any Masters at your May 2010 lecture in Nagoya, Japan? A. Yes, three: Maitreya, the Master Jesus and the Master in Tokyo. Q. Why doesn’t Maitreya appear under His real name? I think it would be better. He must know, and will know, that when people respond to His ideas, they want the changes in the world which He is advocating; not because of His status, not because He is the World Teacher. If a World Teacher says we need to share, it is easier to believe the Teacher than to see for oneself that sharing is the only possible answer to our problems. When you see that sharing is the only way to justice and therefore to peace, you are making an inner spiritual step in awareness. Not everyone sees this. Why do you see this? Because you have this spiritual awareness. It is the result of an inner awareness. But if you just accept it because you have recognized Maitreya it doesn’t mean that you are aware of the need. He has to know that enough people are responding from their own spiritual awareness. Why do millions of people not share now? Why do people not see inwardly that sharing is a natural thing in a family of brothers? In a home the mother, father and children share everything. Likewise, we are in a home called Earth and we are brothers and sisters. Everything on Earth belongs to everyone and therefore should be shared. Everyone’s needs should be met. But it is not happening. Why? Because people do not have that inner spiritual awareness. They do not make it happen; it does not occur to them. We have free will, we can choose to share or not. If we decide to follow Maitreya’s advice (whether we know it is His advice or not is immaterial) we will save the world. If we decide, however, that we do not want sharing, if there are not enough people who want change, sharing and justice, then we will destroy ourselves. It is as simple as that. Maitreya knows that there is a ‘critical mass’ of 1.8 billion people ready to adopt His advocacy. When those 1.8 billion people make known where they stand and demand that their governments change their ways of working and share the resources of the world, it will happen. Q. What can we do to get rid of capitalism? A. We will not get rid of capitalism, we will give it a place in our society. It is not necessary to think in extremes, in black and white. No one ever thinks of these working together but Maitreya puts it this way: think of a cart; if you only have one wheel – whether capitalism or socialism – it will not go. All economic structures of the future will retain the balance of socialism and capitalism. Today there is no country in the world which has the balance right. The trick is to get the correct balance. From the Masters’ point of view, the best balance is 30 per cent capitalism and 70 per cent socialism. Which countries are most stable? The Scandinavian countries. Their balance is around 60 per cent capitalism to 40 per cent socialism, which is still quite far off the best balance but it makes for a more stable society, which has no great wealth or poverty. It makes for a stable society with stable government. One of the major problems from the economic point of view is that one of the most powerful countries, America, is 95 per cent capitalist to 5 per cent socialist; in Europe it is somewhat less: between 80 and 85 per cent capitalist to 20-25 per cent socialist. The perfect balance of 70 per cent socialism to 30 per cent capitalism works for all. You can see how far off the major nations are and therefore how far out of balance the world is. Japan is about 80 per cent capitalist and 20 per cent socialist. It is not a question of either/or, it is the right balance of both. Q. (1) Do you personally feel that the recent explosion on the oil rig in the Gulf of Mexico and the resulting environmental catastrophe is the final coffin nail, so-to-speak, in the call for more off-shore drilling in America? (2) May I ask how many hundreds-of-thousands or millions of gallons of oil have flowed into the ocean from the broken oil pipe off the southern coast of the US at the time of your answering this question? A. (1) No, I am sorry to say. I do not think so given the constant lust for more oil of the American oil companies (for whom it is liquid gold) and a large section of the American public who have been conditioned to fear its demise. (2) Several millions. This accident is being heralded as the ‘greatest catastrophe ever to have occurred in the USA.’ I personally do not take this view. Several similar have occurred even within quite recent years in the USA, Europe and elsewhere. Nature has a wonderful way of absorbing and overcoming these accidents and usually within a few years, the life of the area affected goes back to normal. Q. (1) Has Maitreya been asked about the situation between Israel and the Palestinians now that the blockade of Gaza has captured the world’s attention? If so, (2) What is the general nature of His response? (3) Has He spoken, in answer to a question, about the oil leak in the Gulf of Mexico? If so, what is the general nature of His response? A. (1) Yes. (2) Maitreya deplores the present tragic situation of the Palestinians and makes His viewpoint clear. He urges the USA, instead of supporting the cruel actions of the Israeli government, to use its influence with the Israelis to end this inhuman blockade and to begin negotiations for peace. (3) No. Q. Was the explosion that sunk the oil drilling rig in April 2010, which has resulted in colossal environmental damage off the eastern US coast, the result of karma and, if so, may I ask why? A. No, it was an accident. Actually, it has not resulted in “colossal environmental damage” but in ‘potential’ environmental damage. Seen from Europe, President Obama (and he would normally have my vote) is overplaying his attempt to hold BP to account for every dollar of loss occurred. BP has already accepted responsibility and readiness to meet bonafide reasonable claims. I wonder if the American public knows that BP is half-owned by US investors. Q. 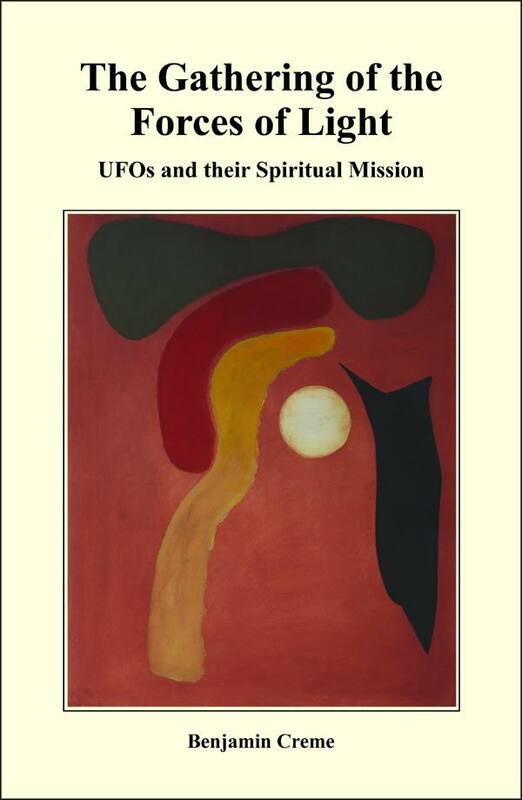 Could you tell us the title of your painting that is printed on the cover of your new book The Gathering of the Forces of Light: UFOs and Their Spiritual Mission and what it represents? A. It is called ‘Pluto routed’. It represents the eternal struggle that goes on in every solar system between planets at different stages of evolution. Pluto is a powerful 1st Ray planet which unfortunately is not very evolved. Each planet has seven ‘rounds’ or incarnations. Pluto is in its second round only, therefore it interferes negatively in the lives of other planets. The central sun-like disk represents Venus (7th round), behind which Jupiter (6th round) is represented by the long yellow form, with the red form of Mars (4th round) behind Jupiter. Earth (4th round) is seen as the green form at the top of the painting. Pluto (2nd round) is seen as the black form retreating on the right, routed by the combined spiritual power of the other planets. Needless to say, the painting owes much to ‘artist’s license’ in the depiction of the forms. Q. Are the spirit world and the etheric world the same? A. No. Spirit world, as spiritualists use the word, is the area of consciousness where people who have died ‘reside’. It is not a place but a state of consciousness. The etheric planes are planes of the solid physical world but on the subtler end of that physical plane. Q. If we have an etheric body can we see the UFOs and space brothers? A. Everyone has an etheric body, but that doesn’t automatically give you etheric vision. 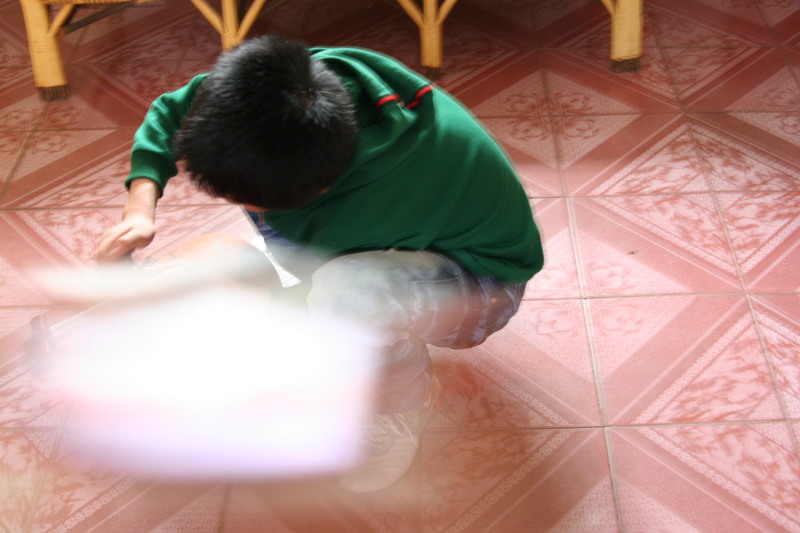 This will come in gradually as more and more children are born with etheric vision. Q. On Venus the climate is so extreme – how can people live there, even if they are in etheric bodies? A. Venusians are very evolved. Venus is in its last incarnation or round; Earth is in the middle of the 4th of 7 rounds. If you lived on Venus you would have a body enabling you to live there very comfortably. Q. When will humanity begin to recognize the fact of etheric matter? A. Very soon. Already our scientists – especially those working in the field of astronomy – have become aware of some kind of matter which they do not understand. They know it is there. Their calculations tell them it is there but they cannot see or experiment with it. They call it ‘dark matter’. That so-called dark matter is in fact the etheric levels of matter. Q. When will this take place? A. If they opened one of the books of the esoteric teachings written by Madam Blavatsky, Alice Bailey, Helena Roerich or even myself, and read enough about matter and the state of the etheric physical planes they could have the answer in one afternoon. Instead, they build a huge cyclotron which took 25 years to build and cost millions to make in order to prove the reality of dark matter. Q. What is the Masters’ view of genetically modified foods? A. Generally speaking, the Masters do not view this as an advance. Much depends on the process used and the food itself. Generally, the Masters recommend the purest, least modified and organically grown food, as fresh as possible. On 4 June 2010 a number of group members joined many others in Amsterdam in a demonstration calling for justice for the Palestinians sparked by the Israeli attack on the aid flotilla off Gaza. Two of us left the demonstration after some hours to go back to the Share International Information Centre by tram. As we were waiting for a second tram two young women approached us. “I couldn’t help noticing your sign, can you tell me about it, please?” Our signs read: “The Palestinians are us” and “Let the people live”. The taller young woman who did all the talking said she had wanted to attend but had missed it for some reason. The two girls, in their 20s, looked so familiar. We were both sure we knew them; I remarked on it: “You’re so familiar. Don’t I know you?” Both girls were attractive, smiling and had a lovely manner. The taller one, to my mind, looked more English than Dutch, with a soft heart-shaped face; she had lively, intelligent dark brown eyes. Her companion could have been any nationality with her dark hair, aquiline nose and pale complexion. She was entirely silent but smiled throughout, listening keenly to the exchange. Why did we go to the demonstration, asked the tall girl. We talked about solidarity, justice, peace, trust, with sharing as the solution to building trust. In other words, without justice for all there can be no trust and also no negotiations in the Middle East. All peoples have equal rights. We are one family and all have the right to food, water, housing, healthcare and so on. She, too, concerned herself with the Middle East, she said. We were being interviewed and quizzed, put through our catechism by the sweet young woman. “How would this happen?” “What is needed?” We told them about Share International, about Benjamin Creme’s work, about Maitreya, the World Teacher who comes not as a religious teacher but for all. “How will he make himself known?” He is appearing on TV calling for sharing, justice etc. But the world must respond to His ideas, not to Him because of His status. Basically we gave as much Emergence information possible in the few minutes at the tram stop. At some point I was stuck, looking for a particular Dutch phrase, and she encouraged me to go on in English – which she said modestly she could manage OK. She then continued to question us in excellent English with no trace of an accent. She went on putting us through our paces; her questions were so intelligent and led us on so that the story unfolded logically. We remarked on how nice it was that she asked so many questions. It was inspiring, she said. “Why do you think this is important?” “What attracted you to this information?” “How did you hear about it?” She went on constantly bringing us back to our own involvement and commitment: “Now this is a personal question, I know we don’t have much time standing here at the bus-stop, but what was your journey – what brought you to this story? How did it begin?” I answered. We left the tram and I peered in, wanting to wave goodbye. I should have been able to see them although they were sitting on the other side of the tram. Perhaps I didn’t look carefully enough, but either I didn’t see them or they weren’t there. Were our sweet persistent interrogators simply inquisitive young women? M.L. and F.E., Amsterdam, the Netherlands. Today, 4 June 2010, a number of co-workers from various Reappearance groups in the Netherlands joined the protest in Amsterdam against Israel’s outrageous attack on the Turkish aid flotilla heading for Gaza earlier this week. At one point during the protest meeting an attractive Arab-looking young woman, about 30 years of age and wearing dark blue harem trousers, a beige cardigan, a shawl half covering her head and carrying a blue backpack, came up to us teary-eyed and said something like: “I just want to tell you how moved I am by seeing you here and by your signs. We really are all one. Can I just give you a hug?” She held out her arms as if she wanted a group hug, and since she was standing in front of me I leaned over and hugged her, saying “Thank you!” The scene felt like a living example of brotherhood and unity, and her heartfelt remarks and gesture moved us all. She went on to say something about Jesus who had also come and had given his blood, and that Gretta Duisenberg, a well-known Dutch activist for the Palestinian cause who was mistreated at a rally earlier this week, couldn’t be here today. After referring to Mrs Duisenberg as a mother, she said: “I’m just an unknown mother.” She moved along among the protesters in front of us, where a woman photographer wanted to take her picture, but she refused. After speaking to some other people she sat down on a concrete block for a while before walking off. Could it be that the young Arab woman was not just another protester? At Benjamin Creme’s Tokyo Lecture in 2010, the 2,070 seats capacity Hibiya Public Hall became quickly full to capacity immediately after the door opened. Thirty minutes later, a long queue was formed at the entrance by the people who were not able to get in. Since we were concerned about the people having to stand outside in a queue for one or two hours till the intermission, we offered to prepare a waiting list and record their mobile phone numbers, so that we could call them as soon as someone left. As more and more people came to stand in line, I felt I wanted to do something to help out, so I walked around among the people in line and explained the situation. He said: “I really want to hear this lecture, but it may not be possible judging from such a long line of people waiting for it!” He looked very disappointed. I recommended him to go to the book corners in the lobby to browse through or to come to Michiko Ishikawa’s lecture (which was quickly arranged) in Tokyo in June. I also told him about the lecture in Osaka the following week and handed him the information sheet. Eventually, over 130 extra people were able to come inside the hall, but I didn’t see this man. I wondered what happened to him, because he seemed so eager to hear. Was he just a nice person? On 9 May 2010, at the public Transmission Meditation in Tokyo with Benjamin Creme, my sister and I were working at the table where Maitreya’s ‘hand’ cards and Benjamin Creme’s Esoteric Art (mandala) booklets were displayed. Not far from us was the book table. The hallway was quite small and was very crowded with the people who came to attend the Meditation meeting. My sister and I were overwhelmed by this man and we felt very grateful. It is hard to explain in words, but I felt I was given some light leading to a new awareness. (1) Was this man a special person? (2) Does OM include the meaning of gratitude, as the man said? I was standing beside my sister, watching closely his eyes while listening to their conversation. I could not keep my eyes off him, because in spite of his quite ordinary appearance, he had extraordinary eyes. They were not only piercing, but at the same time very deep, giving me an impression that they were seeing beyond this physical realm. His eyes looked to me deeper than the sea and higher than the sky. I was very moved by them. Some days later, I attended the Share Japan Conference. When Mr Creme mentioned that some artists paint watered down paintings, and people often live “watered down lives,” I remembered this man’s eyes. I strongly thought that we should not water down our words, paintings or writings, and above all, we should not live watered down (lukewarm) lives. I felt deeply that I would like to choose a way of living as deep as the sea and as high as the sky. I wished to be a kind of person who could have such deep and lofty eyes. In March 2007 Benjamin Creme’s Master wrote: “Important events are taking place in many parts of the world. People everywhere will be astonished by the reports. These will include sightings, in unprecedented numbers, of spacecraft from our neighbouring planets, Mars and Venus in particular. Nothing like this increased activity, over vast areas of the Earth, will have been seen before.” UFO sightings are now reported so frequently that not a day passes, it seems, without someone somewhere in the world reporting seeing a UFO. We here offer a selection of some of the most significant recent sightings from around the world. In August 2009 I was in Istanbul and while having dinner I saw a large orange ball moving in a straight line across the sky. I watched in amazement but nobody else seemed to notice it at the time. Also, in May 2010 I was looking at what I thought was the ‘star’ in my garden with a friend. We looked at it for a long time and my friend said: “If you are the ‘star’ would you please change your colour to the colour of my jumper?” She wore a dark orange top but the star did not change to any colour and in the end we went inside. Later the same evening I was standing in the kitchen and I saw a huge orange globe in the sky, moving from east to west. I ran downstairs and called my friend again to come outside quickly. We both watched it move slowly across the sky until it disappeared. Only after some time did my friend remember that it was the same colour as her top. One day at the end of May 2010 post office owner Noori Uddin was looking out of his apartment window in north London around 9pm, when he saw a bright orange ball in the sky towards the west. He called his wife and children to the window and they looked at it through binoculars. “It was so bright it was like fire!” he said. It didn’t go away and remained there even when they went to bed. He asks for the latest news on Maitreya when co-workers bring mailouts. “It is true, strange things are happening,” he said. Was this a UFO sighting? On the evening of 15 May 2010 I was with my husband and two co-workers driving home. We were halfway up Mansfield Road in North London when we all spotted a very bright orange fiery light high in the sky. It was moving quite slowly and silently but purposefully in a southerly direction. We watched it for some time before it disappeared behind tower blocks. Again, at around 10.30pm on 30 May 2010, my husband and I were walking down hill to Tufnell Park underground station when we saw a similar big bright orange light which remained stationery for some time. It was so big and bright that it amazed us that people were not pointing at this unusual sight. It then disappeared behind buildings. Please could you confirm what these two sighting were? On the evening of Sunday 9 May 2010 the BBC broadcast the last programme in the series ‘Wonders of the Solar System’. The presenter speculated on the possibility of life on other planets and then the credits rolled to the sound-track of the Carpenters’ song Calling Occupants of Interplanetary Craft! I looked out of the loft window where I had seen a fleet of UFOs on New Year’s Eve. A glowing orange spherical object was moving steadily across the sky on the same path as the previous sighting, coming from the east. It was much too large for a Chinese lantern, and not blown on an erratic course as a lantern would be, buffeted by wind. It moved majestically overhead then disappeared behind the roof of our house. It made no noise and had no flashing lights as planes do. It seemed to radiate energy and purpose, and the sighting left me feeling revitalised. Can you please tell me what this craft was? After a family meal to celebrate a birthday on Saturday 12 June 2010 my partner and I were seeing our guests out to their car. It was about 11.30pm. We looked up and saw a bright red light and thought it was an aircraft. We kept looking as the light was quite still in the sky and glowing bright red. Then another one appeared. The four of us were intrigued: what on earth were they – could they be Chinese lanterns or, possibly, aircraft? As we watched, one after another appeared until five large, glowing red lights were ahead of us in the distance. They appeared to move towards our house, quite evenly spaced apart, in a south-westerly direction but then turned and, all in sequence, headed north. It was hard to tell from the ground but they looked to be quite high, possibly 10-15,000 ft. If they were Chinese lanterns we did not think they would have been so organized in their flying pattern. Could you please tell us if these were spacecraft? If so, where were they from? On 15 May 2010, shortly before midnight, a friend and I were sitting outside around my patio fireplace. The sky was completely clear with several stars shining in the night sky. We had watched Venus set in the west only a short time earlier and I suddenly noticed what appeared to be a small cluster of stars off to my left. As I looked more intently I saw them come into better focus. They seemed to “phase in” and become more distinct and gently moved across the sky toward us. As soon as I got a distinct image of them I instantly thought to myself that these were Space Brothers. I excitedly shot my arm up into the air and pointed at them saying, “There’s a UFO!” My friend turned her head quickly to look and we watched as it gently glided through the atmosphere almost directly above and in front of us, then gradually picked up speed and headed off to the right and quickly “dissolved” into the night sky. 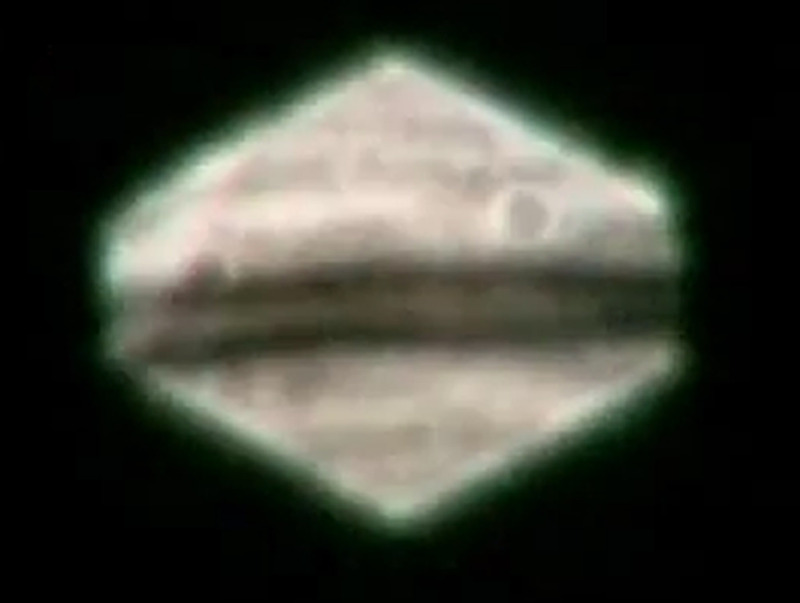 The craft itself was dark but appeared to be triangular shaped, based on the position of the lights around its frame. I had seen many images like it before on the internet, such as the spectacular night sighting of lights over Phoenix, Arizona, in 1997. There was one light on the front, one about half-way along each side, and one on each tip at the back of the triangle. There was another light in the middle of the body near the outer edge furthest from us. It was not immediately apparent to me whether this was one object with six lights or six objects flying together in formation. As it passed closer by and overhead, I had the sense of it being one craft though. It moved completely without sound although it seemed to be only a few hundred feet above us and we could hear other sounds from quite a distance in the evening air. It seemed to cut through the air effortlessly as though it was entirely weightless. While we were surprised at first, there was no sense of fear or concern. In fact, I had a distinct sense of excitement and elation along with a feeling of love and appreciation for the inhabitants of the craft. My friend said that it felt like a blessing had occurred. Indeed, I think that fully described my experience as well. (a) Was this a ship of the Space Brothers? (b) Which planet did they come from? (c) Is it common to have a sense of being blessed when in the presence of the Space Brothers? d) It seems as though they came into sight for a short period, made a brief ‘fly-by’, then disappeared again. Were we the only ones witnessing the show or did others see it? On Friday 11 August 2009 I woke suddenly at 1.30am and felt compelled to look out of my bedroom window. The sky was totally clear. High up and straight ahead in the east was a very bright twinkling star. All the other stars were no longer visible in the clear sky. Was it the ‘star’? A very bizarre medical case in Northwest China has parents, doctors and the media baffled. An 18-month-old girl is excreting metal nails with no apparent discomfort and no sign of her having eaten anything other than normal food. Doctors at the Children’s Hospital of Yulin city, Shaanxi province, where the little girl is being kept under observation while her astonishing case is being investigated, said the baby girl has excreted 21 nails and a steel pin during the past month. “At first we thought the baby accidentally swallowed such things, but after being confined in the hospital she continued to expel nails day by day. And more surprisingly, x-rays showed new nails in her stomach after each excretion,” He Bo, president of the hospital said. It is not unknown for babies to swallow all sorts of objects; at a certain stage of development toddlers tend to put things into their mouths. It is also a medical fact that, if lacking certain minerals, babies may try to satisfy that need by eating charcoal, soil and so on. But this strange case is unprecedented. The baby’s parents told the media that they are entirely at a loss as to how to explain their daughter’s case. They wonder whether for some inexplicable reason their daughter might be “producing” nails in her stomach. The doctors showed reporters four nails and a steel pin they claimed the girl has excreted. He Bo announced to the media that from now on the girl will be placed under closer scrutiny and confined to her hospital bed. In a similar case, in August 2008, Indonesian media sources reported on the strange case of a woman whose body produced fine metal wires just under her skin and protruding through it. The wires were between 10-20 cms long. The woman’s name is Noorsyaidah; she is a teacher from Sangatta, East Kutai and a graduate of Mulawarman University’s school of social and political sciences. Her first symptoms started manifesting in 1991. The metal wires grew out of her chest, her belly and hands. “God probably wants to show His Almightiness through this odd disease,” said Noor. A cook who was on the oil platform that exploded in the Gulf of Mexico on 20 April 2010 was led to safety by a man wearing a white T-shirt. Oleander Benton was sitting in a laundry room when the explosion occurred. Amid falling debris, she managed to make her way into a darkened hallway. Light blessing by Maitreya on photograph of P. R.s’ grandson, in Manchester, UK, taken in January 2010. The cross of light in E.A.’s bathroom window, Berne, Switzerland, 25 October 2009, was magnetized by the Master Jesus. We present a selection of quotations on the theme of ‘Brotherhood’ from Maitreya (Messages from Maitreya the Christ, and Maitreya’s Teachings – The Laws of Life), Benjamin Creme’s Master (A Master Speaks), and Benjamin Creme’s writings. The reappearance of the Christ in relation to humanity is fundamentally about the birth of the Christ Principle in the hearts of all humanity. That awakens the love aspect, and therefore sharing and justice, right relationship in a word, is guaranteed in this coming age. Right relationship does not happen by itself. Humanity has to make it happen. The awakening by Maitreya of the Christ Principle in the hearts of all humanity is the method by which His major work, which is on the astral plane, is carried out. For long, men have searched in vain for the key to this yearned-for harmony. Always, their highest aspirations and efforts have been to no avail. Now, for the first time, the dawning realization of oneness is impressing men to share, and to regulate their living along more just and safer lines. The new Era, the Era of Light, is upon us, and in this coming time men will find the inspiration and guidance which their forefathers lacked, or ignored. Now, at last, men and the Masters will work and move forward together, united in the common bond of Brotherhood and Trust. Our example will inspire men to superhuman efforts and achievements, and bring the Light into the hearts and minds of all. Thus will it be. Thus will the great secrets of creation be revealed. And thus will man become the creator and regulator of his own destiny, a God-like Being, worthy of the name of Man. The brotherhood of man has been an ideal for hundreds of years but there is no brotherhood of man in the world today. It was mooted as an ideal in the French Revolution: equality, fraternity and liberty. But where is the true equality? Where the fraternity, the true liberty? They do not exist except as potent ideas in the mind of humanity. Suddenly, men will realize that their life till now was a shallow thing, lacking, for the majority, all that makes life dear: brotherhood and justice, creativeness and love. Many will know for the first time that they count, that they matter in the scheme of things. An unfamiliar sense of self-esteem will replace their present hopelessness; drugs of all kinds will cease their hold on men. Quietly, men’s tears will flow in humble gratitude and longing for the good. 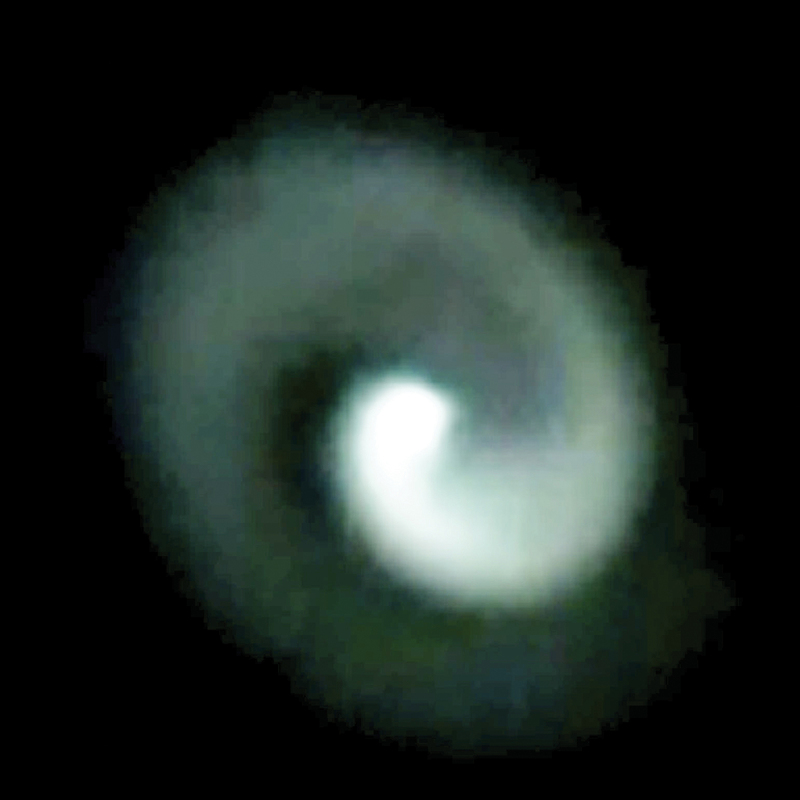 The spiral light seen across eastern Australia in the early morning of 5 June has been confirmed by Benjamin Creme’s Master to be the ‘star’ which heralds the emergence of Maitreya, the World Teacher into full public recognition. Scientists are attempting to explain away this latest spiral phenomenon as the effects of a private spacecraft launched in the US. 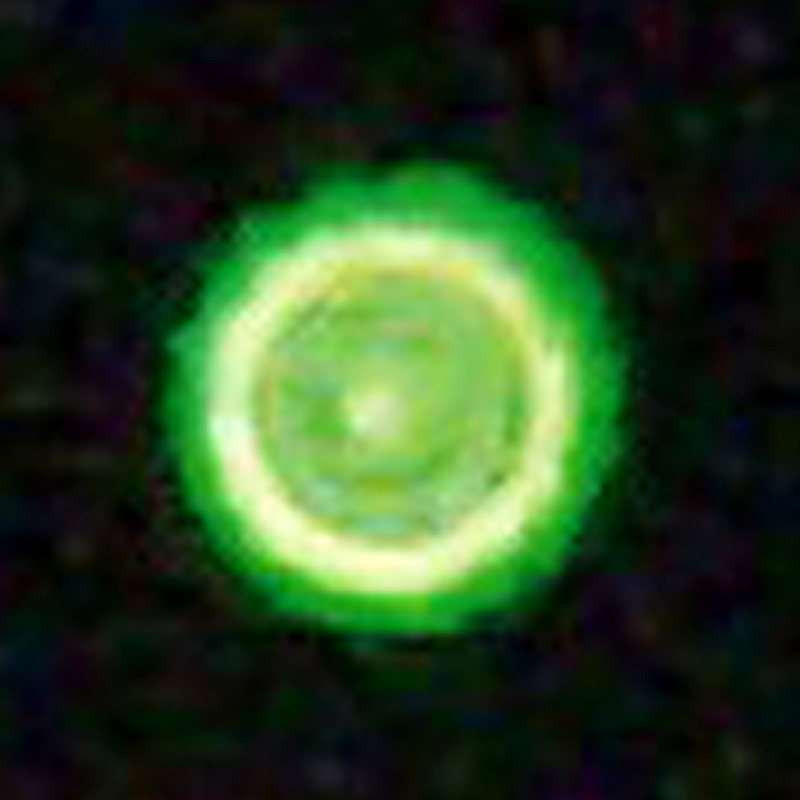 Witnesses and many other commentators have pointed out that this spiral light is reminiscent of the spiral formation which appeared over Norway in December 2009 and which was confirmed by Benjamin Creme’s Master to have been the ‘star’ heralding Maitreya’s emergence. At the time, Benjamin Creme’s Master also noted that many more such spectacular celestial signs could be expected. People out in the early morning, about 5.45am, were treated to an amazing spectacle. Reports of the spiral star sighting quickly reached The Sunday Mail, radio stations, the police and even search and rescue services. Officials at agencies from the weather bureau to the Defence Department could offer no explanation but all who saw it agreed that it was extraordinary. UFO Research Queensland spokesman Pino Pezzimenti said it was “extremely unusual” for a UFO to be seen over such a wide area and for such a long time. 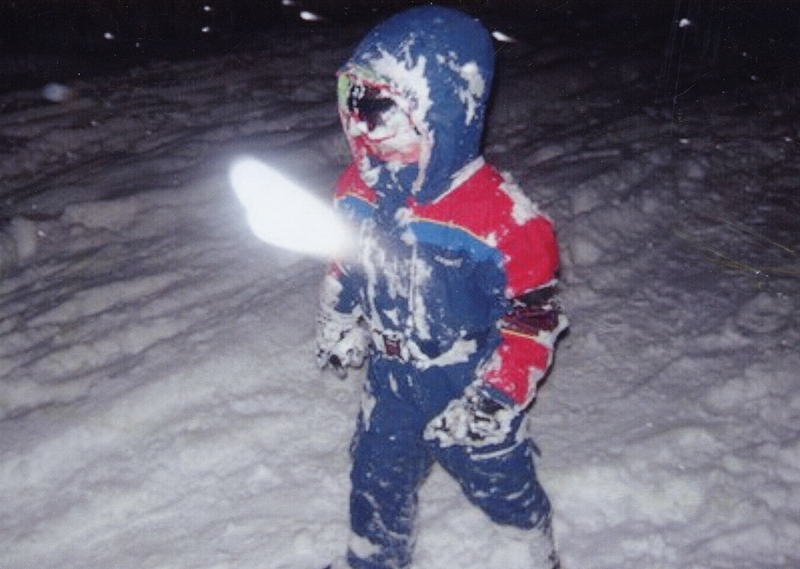 Witnesses were quick to compare the light with a similar recent sighting in Norway. 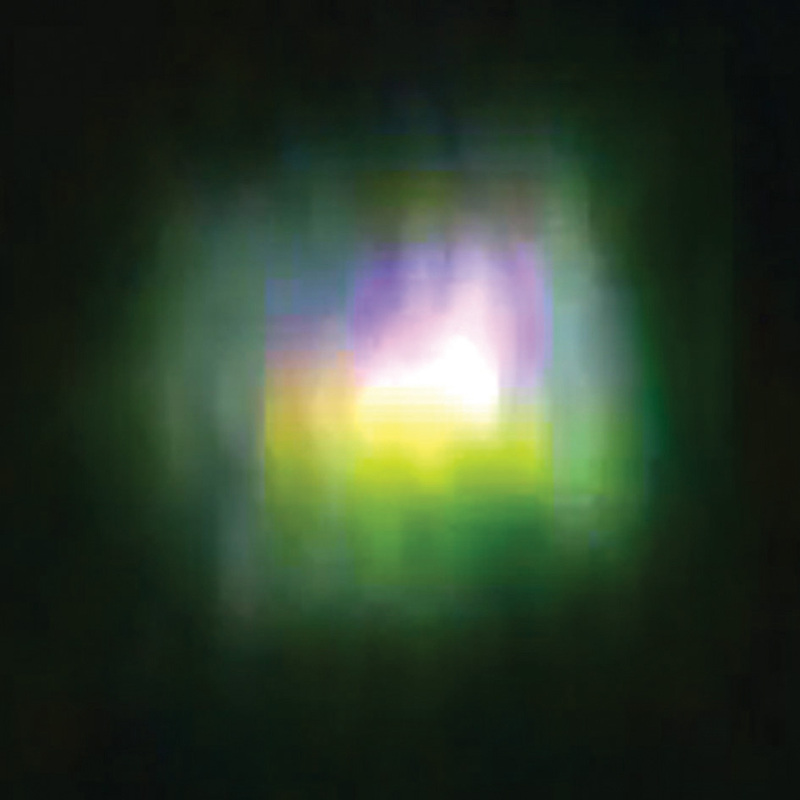 Ben Harris – who has written magazine articles on UFOs – had just taken his wife to work at Taigum in Brisbane’s north when he saw the light and took 18 photographs with his mobile phone camera. “It’s absolutely freaky. I believe I’m a good sceptical person and if you ask me what it is, I’ll honestly tell you I don’t know,” he said. Jeff Hannah, from Redcliffe, was out jogging with friends when he saw the “perfect spiral of light”. “I realised soon it was not the moon but that it was shooting like a comet from the southern sky and off into the northwest,” he said. A police spokeswoman said: “We have received calls from the Gold Coast, Brisbane and the Sunshine Coast.” And ABC News Online received dozens of emails, pictures and videos from those who claim to have witnessed the huge white light. A number of people from Morayfield and Caboolture in Queensland have reported that they too saw a white light in the sky about 5.50am. “It was just the one light. I just came home from my walk and I happened to look up in the sky, and here it was racing across the sky,” Linda told 612 ABC Brisbane. “It was spectacular.” She described the light as like a lollipop swirl. Another eye-witness from Balmoral says he saw the light while he was on a ferry terminal on the Brisbane River. “It certainly had that lollipop-type swirl ... but it was travelling low and fairly fast, and as it went past me and I looked up, it looked like a row of lights, maybe four lights,” he said. On Sunday 23 May 2010 I noticed from my window a beautiful bright star and decided to take some photographs of it. 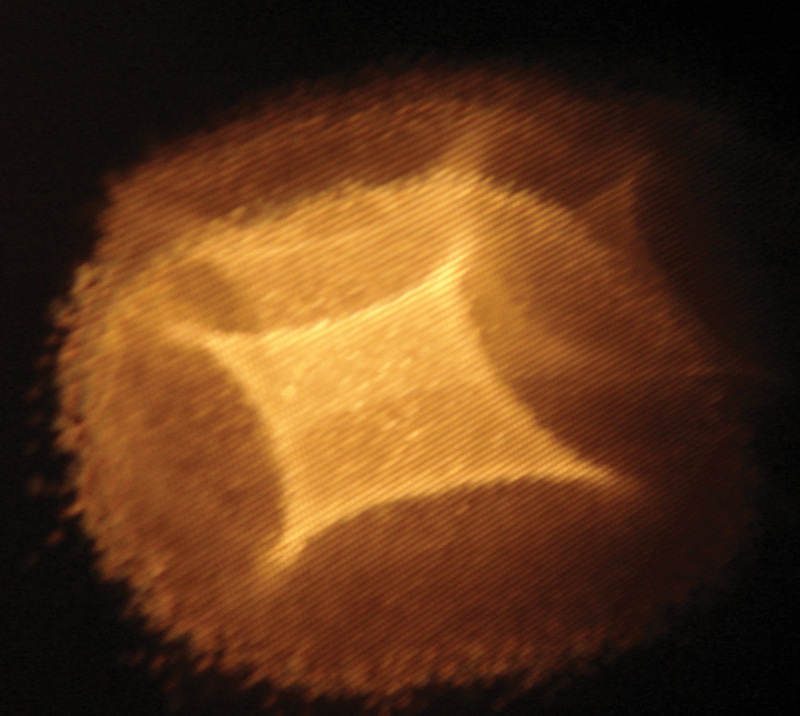 As I was attaching my camera to the tripod I noticed through the window a bright orange light. When I got outside the orange light had gone. I continued to photograph the bright star and to my surprise the orange light appeared again. I was delighted as on my screen I could see both the star and the orange light. I didn’t think the orange light was a plane as there was no flashing light visible as it moved from left to right and eventually faded away. What was the bright star and the orange light? C. E., Hullbridge, Essex, UK. 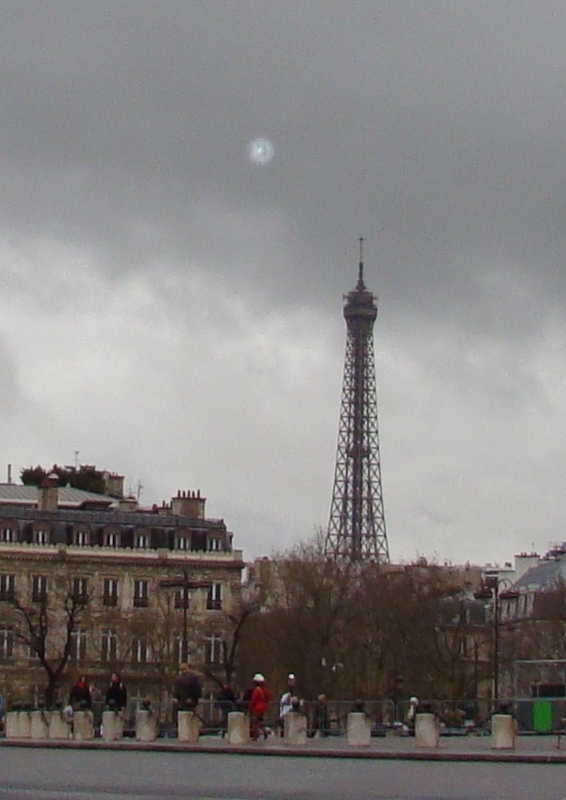 Paris, Place de l’Etoile (Square of the Star) with the Eiffel Tower in the background, taken on 3 April 2010 by J.C.L. Benjamin Creme’s Master confirms that this is the ‘star’. The ‘star’ taken over Hullbridge, Essex, UK on 4 May 2010 by C.E. The Gathering of the Forces of Light is a book about UFOs, but with a difference. It is written by someone who has worked with them and knows about them from the inside. Benjamin Creme sees the presence of UFOS as planned and of immense value for the people of Earth. Creme shows how all the planets of our solar system are inhabited, but on physical levels beyond present human sight, the so-called etheric planes. The spacecraft are constructed on the same principle; they too are in etheric matter and have complete control of energies in space. Our Space Brothers are responsible not only for crop circles but also for preparing the way on Earth for a new technology of light which will give us unlimited power from the sun. When we banish war forever and are endeavouring to live in right relationship, that technology will be ours. For the Spiritual Hierarchy of both our own and the sister planets of our system, right human relationship involves the end of competition and the beginning of an era of co-operation with sharing, justice and freedom as its hallmarks. Fantasy? Benjamin Creme writes with such cogency and authority that it is difficult to gainsay his message. We leave it to the readers to come to their own conclusion; in any case, according to the author, the truth will soon be apparent for all to see, awakening humanity to their own divinity and the establishment of the rule of spiritual law on Earth. Higgins’ definition of ecocide includes damage done to any species, which would prevent prosecutions getting caught up in legal arguments about whether humans were harmed, as happens with current environmental cases. She has support in the UN and European Commission, and among climate scientists, environmental lawyers and international campaign groups. Higgins has already had success at a UN conference proposing a Universal Declaration for Planetary Rights, modelled on the Human Rights Declaration. This has now been adopted by the Bolivian government, which will propose a full members’ vote at the UN. Polly Higgins was interviewed by Gill Fry for Share International magazine on 12 June 2010. Share International. How do you see the current world situation? Polly Higgins. It is the end of an old world system. We are moving to a far more holistic world and the ending of systems that ultimately don’t work, into a new era that’s not just about accountability and transparency but also about genuine understanding and valuing each other, nature and the world. It’s getting away from the whole concept of commoditizing the planet, of valuing it solely for the money you can make out of it. But if you value the planet as a living being then you start taking responsibility and that is a dramatic shift in approach. More and more people are understanding that the planet is a living being. SI. In these chaotic times masses of people have little control over their lives and destinies. How do we reinstate those rights? PH. If we go back to first principles in terms of international law and the whole concept of self-determination, it’s just been overridden by big business. Indigenous rights have been trampled on in favour of the private, corporate interest. If you’re stuck in valuing only private interest then that’s really about valuing property and consumerism – “what’s in it for me” mentality, whereas if you embrace societal interest you start to value each other and our interrelationship with each other. They are very different approaches: one is coming from a lower consciousness, and the other from a higher consciousness. You begin to understand the connectedness and interdependency of all life. Bees are a very good example. We have colonies collapsing and yet we are hugely reliant on bees. Most people don’t realize that bees pollinate 70 per cent of our food stocks, so to lose our bees we lose our ability to feed ourselves. We are interdependent; we need them and now they need our help. SI. Can you tell us how you became involved in your campaigning work? PH. I was practising as a barrister, dealing with a case that had gone on for three years. I had advised my client to settle but they ignored that advice and I was fighting a case I didn’t believe in, for a client motivated by greed, in front of judges who treated the whole experience as bear-baiting. I thought, why am I not working for what I care so much more about – the planet? I started my research and found that environmental law was too predicated on compromise. It was piecemeal, reactive and put in place after the event. It protected private interest rather than society with legislation based on permits to pollute – not addressing pollution at point of source. In fact environmental legislation from the 19th century onwards was predicated on providing for industry to continue with ‘business as usual’, albeit with a few modifications. This just wasn’t acceptable but I didn’t know where to start. SI. Please can you explain the term ‘ecocide’? PH. Ecocide is a word that’s been around since the 1970s, so it’s not a new word but it has never been legally defined or used in legislation. At the end of World War II an international lawyer Raphael Lempkin realized that we need to create a new language to deal with the horrors of the Holocaust. He literally got on his soap box around the world explaining what the term ‘genocide’ meant. As a result the Nuremburg Trials were set up. There were a couple of crucial legal principles he put in place: that genocide is an international crime and nobody in the world could escape liability. This is key with countries that deny acceptance of international crimes. For instance, General Pinochet in 1998 visited London and a Spanish magistrate delivered an extradition order to Bow Streets magistrates. Chile said they weren’t signed up for Crimes Against Humanity but the House of Lords said it was an international crime and therefore applies to all. It was a very important testing of that principle because nations and Heads of State try and sidestep their responsibilities even though crimes have been committed. After the Nuremberg Trials there was the Cold War, and there was no international criminal court until the late 1990s when ad-hoc courts were put in place following the genocide in Rwanda. The United Nations’ International Criminal Court (ICC) was put in place in 2002, which is a permanent court, with the first case trial in 2006. We have only had four years of dealing with international crime. It is a new idea and we are discovering that it is very effective. SI. Which crimes can be dealt with there? PH. We have four international crimes: Crimes Against Humanity, War Crimes, Genocide and Crimes of Aggression in the run up to war. SI. So there has never been a United Nations’ body to deal with such crimes before? PH. There is the International Court of Justice that deals with member state issues: mainly trade disputes, but not about crime; primarily it gives legal opinions on trade issues. Member states will not take other member states to court for criminal activity and the public don’t have a voice. Whereas the new ICC has four ways to initiate procedures: a member state can submit a request; the Security Council can recommend action be taken; the prosecutor can raise it of his/her own motion; or a person can submit a request that a prosecution be levied. SI. So if thousands of people proposed that, for example, George Bush or Tony Blair should be prosecuted for the illegality of the Iraq war, then the ICC would investigate it? PH. It doesn’t need to take thousands. It can take a letter from one person for the ICC to decide whether or not they are going to investigate it. The biggest problem is they only have capacity for a limited number of cases at any given time, but it’s proving to be hugely successful. Countries are more reluctant to go to war now because they can now be held to account and be prosecuted by the court if it’s illegal. It is creating boundaries of what is acceptable and unacceptable. The interesting thing about ecocide is that we have a kind of moral awareness-gap happening at corporate, banking and political levels. For instance, The Royal Bank of Scotland is now 85 per cent owned by the taxpayer, and has as a result of the government buy-out become a ‘people’s bank.’ It doesn’t act like a ‘people’s bank’. It is one of three banks in the UK that have put millions of pounds into the tar sands unconventional oil extraction in Alberta, Canada, where indigenous people and wildlife are dying due to the toxic pollution that unconventional tar extraction brings. We need to wake up and fundamentally reassess what we consider to be acceptable damage and destruction to the planet. If we don’t then we are on a roller-coaster ride to what Sir David King calls a “century of resource wars”. In fact we have started already: the Iraq war was a war fought for oil. SI. We have had huge advances in alternative technology like tidal wave power and solar power. Can these supply our energy needs? PH. We’ve got the solutions, and even if we don’t, we can invent them. We didn’t know how to get to the moon when America decided that they’d get to the moon in 10 years with the Apollo Mission. Not only did they crack how to do it, they got there in eight years! This is about the power and ability of humans to co-create the world we want to live in. Set the intent, and make it happen. This is how the world works. William Wilberforce argued for the abolition of slavery 200 years ago. He quickly realized there was no point saying: “Do you mind using your slave a little less?” That’s akin to energy efficiency today, because slaves were a form of human energy. He knew that you had to go upstream to the source of the problem and do three things: pull the subsidies that are propping up the system (the sugar plantations where many were put to work were massively subsidized); make slavery illegal; and put in new subsidies for companies to reinvent the wheels. It’s not about putting the companies out of business but redirecting them, shifting their business interests to non-destructive practices. SI. So there are parallels today? PH. Yes, Wilberforce came up against the same arguments from companies: abolishing slavery would be uneconomic; it would mean loss of jobs; the public demanded it; and it was a necessity. They put offers on the table to cap the amount of trade, to give the slaves better conditions, to create a form of auctioneering and trading. The difference between 200 years ago and now is that all their suggestions were laughed out of Parliament. Today in climate change negotiations we have actually applied all those industry suggestions (carbon permits, cap and trade provisions). We know that under the Kyoto Protocol the clean development mechanisms and carbon trading have been a failure and that emissions are still rising. All you’re doing is shunting the problem elsewhere – while profiteering. The planet has been commoditized. Instead, view the planet as a living being and you start to take responsibility. Once you start seeing slaves as human beings with equal rights, you start taking responsibility. Wilberforce gave up his life to fight that fight, and lived to see legislation put in place two days before he died. He knew that the 300 companies involved in slavery could reinvent their wheels very fast and they did. Overnight they moved from trading in slaves to trading in tea and china, or policing the seas. There was a huge shift in consciousness from the year before, when it was de rigueur to have your slave in chains, to it being utterly unacceptable within society. We need to learn the lessons from history and improve upon them. SI. It also shows how a great idea can take years to be championed and then suddenly, overnight, it’s accepted. PH. Yes, it’s the tipping point. We’re at such a point now – our planet cannot sustain this for many more years. The thing with tipping points is that it doesn’t have to be 50 per cent of the population that gets it. Today, with our ability to assess information and knowledge and spread it across the world, you get a sense of when the uptake will happen and how quickly. Shaping ideas, and providing a new language, is part of getting to that tipping point. So one of my starting points was to get the word ‘ecocide’ into use. We put the website up at the end of April 2010 and when The Guardian newspaper published an article about it we had 28,000 hits that first weekend. SI. The media regularly publishes reports from climate change sceptics. How much opposition is there for your ideas and where does it mainly come from? PH. I don’t pay much attention to those who write articles protesting against my proposals; instead I see it as part of the debate and view it as a productive way of disseminating the information. There are those who think ecocide is a law for prosecuting climate deniers but this is not a law for prosecuting people just because they have an opinion. This is not directly about climate change, but about stopping planetary destruction – in other words criminalizing the source of the problem. Climate change is just a symptom of that. SI. When did the idea for the Universal Declaration of Planetary Rights germinate? PH. I was researching new legislation for solar power mirrors in the desert. We only need 0.3 per cent of the world’s deserts to give us all our energy and 90 per cent of the world lives within 2,000 km of a desert. So we can build concentrating solar power plants in the deserts to give us all clean energy. Then I thought what’s to stop the ExxonMobils of the world coming along and just grabbing the land? How do we protect the rights of that land and in fact the planet as a whole? How do we put in place a duty of care for the planet? The law would have to be international and universal and give rights to the planet. So that would be a ‘Universal Declaration of Planetary Rights’. I started researching and discovered that there was 30 years of thought and written material on nature’s rights. Once we go outside the Western world way of thinking we see this is how indigenous people view the world. I treated it like a legal brief: my client was the planet and I had five months to deliver. I dropped everything and completely researched it. The weekend before the conference I stayed up all night writing my speech, an accumulation of my thoughts and research of the past two years. It felt like I was doing the most radical thing in the world. Five conferences took place on five continents, and this one was for Europe and held in Belfast. I gave my speech and felt very exposed because it felt like I was talking about something not in the frame of reference for regular climate change discussion. SI. How did the audience respond? PH. I remember giving my speech and people clapped. We broke for coffee and as I stood up to go I saw that literally half the conference was coming towards the speakers’ table. I turned round but there was nothing behind me, so where were all these people going I thought? They were all coming to speak to me! It was truly amazing! The rest of the conference just focused round this idea, and repeatedly people said they had spent their whole lives going to climate change conferences but this was the first big idea that could really change the world. They taped it and it was played at the UN in New York. I came home and thought where do I go from here? I had in mind there were a few top NGOs that I needed to be in touch with, one of them being Earth Charter International. By the end of that week by chance somebody had sent me the email introducing me to the Head of Earth Charter UK. Polly was invited to attend an international conference the following weekend in the Netherlands where she met more crucial contacts to extend her campaign. PH. I got very stressed the first few months thinking, how am I going to get a nation state to take this on board? Who do I need to target? Then I thought: “I don’t need to worry – it will happen.” I thought the member state would probably be an indigenous nation like Bolivia – and it was. SI. So now the Declaration needs to be proposed at the United Nations? PH. Yes, it is about a member state proposing the Declaration to the General Assembly at the United Nations. The drafting of the Declaration is already pretty much done and then it will go to the vote. Every head of state will have their UN representative to say yea or nay or abstain. I expect that within the next 18 months to two years it will be up for the vote. Bolivia is really pushing for it and will make sure that it is kept very much on the radar. It needs people putting pressure on the governments to support it. SI. 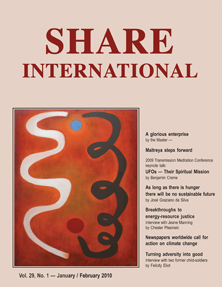 Share International talks about the need for sharing resources on a global scale to address the injustice of our present economic system. Do you think this could happen quickly if there is enough political will? PH. Everyone presumes things won’t happen overnight, but actually they do happen incredibly fast. When it is an emergency, it does happen – literally – overnight. In World War II the Americans came late into the war effort and needed planes. Their aviation industry was not set up to make mass-produced planes so they asked Henry Ford to make planes [instead of cars]. When he refused the government said: “We have passed emergency legislation. It is now illegal for you to make cars.” That is why it is called ‘emergency legislation’. You need the political will to make that decision – fast! Humanity has long pondered over and still heatedly debates one of the most fundamental and contentious issues of our existence: does human free will exist at all? And if so, what qualifies our free will and what conditions it? And how does our free will relate to the laws of Nature or to the Will of Deity? This issue is becoming more and more central to our daily lives as we face the world crisis with increasing intensity. Many myths, legends and sacred texts of the great ancient civilizations touch upon the issue of free will. Usually they depict a hero of royal birth, who is tested by the gods who determine his fate. In the Ancient world during the age of Aries and before, the issue of human free will centred on the fate of emperors, kings and princes, who were described as being of divine lineage and therefore destined to rule. With the advent of the Piscean age and the spread of the teachings of the Buddha in the East and of the Christ in the West, the perception of free will gradually began to change. In the polytheistic traditions of the Far East, religious teachers and thinkers have approached and still approach the issue through different interpretations of the great laws of Karma and Reincarnation. In the monotheistic traditions of the Near East and the West, theologians and philosophers have discussed and still discuss various concerns relating personal will and the Will of God in terms of sin and morality. When human free will is considered, it is usually limited to the personal choice of privileged individuals of either submitting to the religious tradition at hand (and most traditions still present themselves as the one and only true faith with the exclusion of all others) or rejecting it. This, it is believed, leads to either eternal salvation and liberation or to eternal suffering and damnation. Over the recent centuries the issue of human free will has entered into the domains of politics, education, economics, the arts, scientific research, technology and the media. It has increasingly played its part in political revolutions: the abolition of slavery, the start of women’s emancipation, the formulation of universal human rights, social awareness and reform, public opinion, and today in modern culture and new understandings of psychology. The issue of human free will has broken out of its singularly religious mould and has pervaded human living as an ideal at least. At the same time, our abuse of free will is at the root of the world crisis in which millions suffer needlessly of hunger, disease and abject poverty; in which we pollute our environment, damage our ecology and disrupt our climate; and in which we cause violence through crime, terror and wars. More and more we are becoming aware of the fact that the just use of our free will is the key to the solutions, implemented through willing co-operation. Goodwill is at the heart of beneficial changes everywhere. Interestingly, human free will is still not accepted as an established scientific fact, despite recent advances in the neurosciences and psychology. Many scientists today believe – often rather religiously – that the choices people make, and all thoughts leading to these choices, are the direct result of behavioural conditioning, which itself is said to be the direct result of brain activity. In other words: they assume that by now, human free will has been proven to be non-existent and that mind activity is identical to brain activity. In the esoteric teachings of our spiritual Hierarchy, as presented in the writings by Alice A. Bailey, Helena Roerich, Benjamin Creme and others, numerous statements on human free will can be found. These references are both from the personal perspective of individual human evolution and from the perspective of humanity as a whole, as a Centre within the planetary scheme. This is in line with the Aquarian dispensation as we enter the New Age, in which we, humanity as a whole, are gradually becoming aware of our true energetic and esoteric function, both in relation to Hierarchy, the planetary Heart Centre and to Shamballa, the Centre where the Will of God is known. On an individual level, millions of people are becoming aware of their free will, under the increasing stimulus of their souls, leading to action on behalf of our shared humanity and our planet as a whole. Agni Yoga (366) offers some more insight into the importance that Hierarchy places on free will: “Searching for a broad application of the Teaching will give experience to the hand. But one can easily destroy an expected result, for Our voice from afar is like whisper of the reeds. The free will that rebels should not be opposed. We may regret and once again whisper, but the law of free will, as an inalienable characteristic of man, guarantees his dignity. The teachings of Hierarchy (presented for our consideration only) underline that our free will is sacred, though limited, and essential to our evolution as unique human beings within the planetary scheme. We as humanity are being approached by Hierarchy under law which ensures that our free will cannot be infringed. Maitreya, the embodiment of Love on our planet, leads the way in this great approach as the world crisis in all its aspects culminates. In July 2009 Graham Peebles, photographer and director of the charity Create Trust, went to the Middle East to run creative education workshops with Palestinian children in the West Bank. The Trust, formed in 2005 to help Sri Lankan children affected by the tsunami and later working in Addis Ababa, Ethiopia, seeks to build self-confidence and self-belief in disadvantaged children, to encourage independent creative thinking and cultivate an atmosphere of tolerance and understanding. We present extracts from Graham’s diaries and photographs. Photographs in this section (c) Graham Peebles. We drive through the checkpoint and I have my first sight of the Wall – known variously as the Apartheid Wall, Separation Wall or the Israeli’s name, Security barrier. The ‘Wall’ is being constructed mainly on Israeli occupied territories inside the West Bank and substantially deviates from the 1949 Armistice or ‘Green Line’, which demarcates the West Bank. A concrete structure eight metres tall (the Berlin Wall was 3.5 metres high) makes up around 5 per cent of the total barrier’s length. In many places three fences of barbed wire act as the dividing barrier. A land-grab has taken place as the Israelis have redefined boundaries and demarcated territory through the construction of the wall, branding land that had been in the West Bank and therefore Palestinian, as part of Israel. On the surface, life in Ramallah looks fine. It appears much as it does throughout the developed world. Appearance is deceptive of course: it is estimated that 50 per cent of Palestinians – 2 million people, live in poverty. The average income in the West Bank is around $11,000 per annum, this compared to their Israeli neighbours’ $21,000 a year. 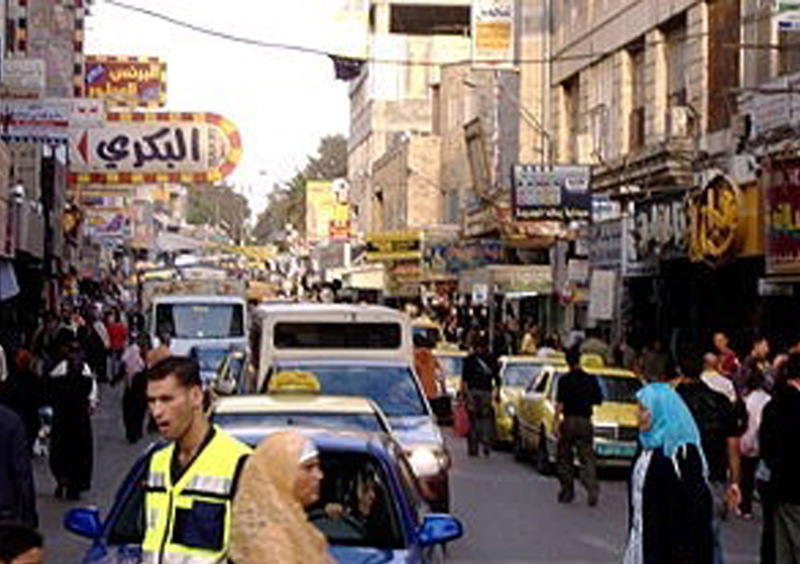 Much of the Palestinian economy is remittance-based, with Palestinians living abroad supporting hundreds of families. To enter Jerusalem from Ramallah by bus we must go through Qalandia checkpoint. Qalandia separates Ramallah residents from southern Palestinian towns and the neighbourhoods of (East) Jerusalem, home to around 200,000 Palestinians. Israeli soldiers check identity cards and passports of all traffic from Ramallah to Jerusalem. I had been warned that it was a pretty ghastly ordeal and could take some time. The bus parks at the entrance to the checkpoint. Issued with a second bus ticket, the passengers disembark and walk through a full body turnstile into the checkpoint. Inside the partly-covered area there are three caged corridors, about 10 metres long with, at the end of each, another full body turnstile, a CCTV camera and a red and green light. Once inside there is no way back, there is no choice but to stand in the queue and wait. It is 2pm and very hot, certainly over 30 degrees centigrade. People are pushed up against the turnstile, which is not moving in any of the corridors. After about 15 minutes a loud siren sounds, the green light shines and one, two or perhaps three people push through the turnstile, then nothing for another 10 minutes. The atmosphere in the queue is calm to begin with, but after 30 minutes in very hot, claustrophobic conditions the anxiety level begins to rise, there is some jostling and shouting through the turnstiles to the unseen guards on the other side. After 45 minutes the turnstiles are released and two by two we pass through to the security check. Much like airport checks, all objects pass through an x-ray scanner and personal documents are checked. I show my passport to a young female officer then walk out and board my original bus and after a wait for the remaining passengers we leave Qalandia. The whole process takes over an hour; it is an unsettling experience, which many people face daily. The children’s session begins with the usual two minutes of silence. We discuss friendship with the group and they are encouraged to share examples of friendship. They are then asked if they could be friends with someone who has completely different interests to themselves. This question causes a major rift in the group, with roughly 50 per cent saying they could, the other half adamant they could not. A highly animated debate followed, with both sides marshalling their arguments and presenting their case through an elected spokesperson. After 45 minutes of debate, the balance shifts there are now 75 per cent in agreement that ‘yes’, friends could have different interests. A powerful way to break conditioned patterns of thinking is through drawing and playing. Working in pairs within small groups, the children are asked to make drawings using geometric shapes to depict qualities of friendship. One boy for example draws a circle, with arms and smaller circles; this drawing morphs into an army jeep and a soldier with a gun. The road to Nablus is dotted with Israeli settlements built strategically on hilltops. These individual hilltop settlements grow and then merge to form one large town. The settlements are a world within a world, often gated, always guarded. The Israelis settlers live altogether more comfortable lives than their Palestinian neighbours. Stories abound of settlers attacking Palestinian farmers, beating them, burning or cutting down their trees and crops and generally making life intolerable. The settlers have access to Israeli-only roads and tunnels, use settler-only buses, and have ample, disproportionate supplies of water and good electricity services. Housing is subsidized. Maale Adumim, with 30,000 residents, is one of the largest Israeli settlements in the Occupied Palestinian Territory (OPT). In an arid area bordering the Jordan desert, the settlement is adorned with palm trees and gardens bursting with colour. The supply of water in the region – on average 1,100mm annually in the north, but only 100mm in the far south – is a major issue. The Wall has meant it was possible for Israel to confiscate sources of water: springs and ground wells, once on Palestinian land, are now inside Israel. Israel takes the water, provides ample supplies to settlements inside the West Bank, enough for tree-lined avenues and landscaped gardens, and rations water to Palestinian communities. The apartment I stayed in in Ramallah, for example, received mains water only once a week: water tanks and jerry cans are filled to provide water until the following week. Palestinians have no legal control over their own water resources. The Israelis determine the water supply, which is far below that of Israel’s, and well below World Health Organisation (WHO) standards. The inadequate water supply is affecting the Palestinian economy and having a ‘de-development’ effect. Try buying fruit which is produced inside the West Bank and you’ll find it very limited. I would estimate 80 per cent of all available fruit and vegetables are ‘imported’ from Israel. A small example of the daily inconvenience and controls placed upon Palestinians by the occupying Israeli forces: I met a man working in a pharmacy in Ramallah, from a village outside Nablus. For three years he has been denied access to the city, where he had work and family, due to what the Israeli military described as ‘problems with his ID’. He would repeatedly queue at the checkpoint for hours, only to be turned away. Offers by the man to have his ID renewed were dismissed by the soldiers. Another example is travelling within the Occupied Territories. Travelling the 30 kms from Ramallah to Halhul, avoiding checkpoints, requires making a huge semi-circle around Jerusalem; the journey takes one hour and 25 minutes. When we arrive at the community centre in Halhul at 10.30am for the first workshop, the temperature is already 30 degrees centigrade. Thanks to further checkpoints and searches, our return journey takes almost two hours. A few miles outside Halhul we spot an Israeli military lorry and jeep parked at the side of the road, where a young Palestinian has a simple stall selling fruit and vegetables. Israeli soldiers are breaking up the stall, pulling the makeshift tarpaulin roof down and kicking in the sides. Farther along we see another eight stalls destroyed and abandoned. A common practice, I later discover, and one that is illegal under Israeli law. According to Israeli military the stallholders are trading without the required paperwork. The permits issued by Israeli authorities, according to Palestinians, are difficult to obtain but needed to trade inside the West Bank, supposedly Palestinian land. House demolition is a particular horror for many families. Demolitions are usually done without prior warning and often during the night. The inhabitants are given little time to evacuate – anything from a few minutes to half an hour. Once a demolition order has been passed by the Israeli authorities, it may be executed any time – immediately, or after 10 years, 20 years or more. A family, known to a colleague here, has been living under the ‘imminent’ threat of demolition for 37 years, causing them untold stress and anxiety. Once an order has been passed, the family has a choice. They are free to move before the house is levelled, demolish it themselves, or stay in the knowledge that at any moment their home may be knocked down. If the Israeli authorities carry out the demolition, the family may be presented with a bill for the work, up to $20,000 – lose your home and pay for the privilege!